Villa Dolicha | Discerning Collection. Hotels, Villas. This is a truly stunning property, and perfect for a family, with 3 well appointed bedrooms, a spacious living and dining room and fully equipped kitchen. The highlight of Villa Dolicha however, has to be the expansive terrace with its shaded dining area, perfect for barbecues on balmy summer evenings, and of course the huge infinity pool with mesmorising views out to sea and over the island of Ithaca and beyond. For those guests wanting to sample the delights of Fiscardo Harbour, it is only 10 minute walk in to town, and the pretty beach of Embilisi is also nearby, making its location hard to beat. Guests at Villa Dolicha have the added bonus of using the private entrance into the five star Emelisse hotel where they are more than welcome to use the facilities including the famed restaurant and many treatments available at the Spa. If you prefer to stay at home, it is even possible to arrange for massage and beauty treatments at the villa, or perhaps a private chef for an evening to prepare a mouth-watering meal in the comfort of your own home. Villa Dolicha is furnished to a very high standard and has a fully fitted kitchen, lounge and dining room, 3 bedrooms (2 doubles and 1 twin) and a large terrace with infinity pool with spa jets. There is also free wifi at the villa. Next door is the luxury Emilisse Hotel where guests at the villa have private access through a gate and can use the Spa and restaurant (payable locally). Whilst the availability calendar is upto date, the villa is on a request basis, so please get in touch with us and we will reconfirm availability for your chosen dates, we know the owner very well so this shouldn’t take us long to check. If you would like us to source flights we can do this for you no problem, it takes all the hard work away from you. We will arrange transfers for you or can book car hire for you, whichever you prefer. We will advise at the time of booking the additional costs. 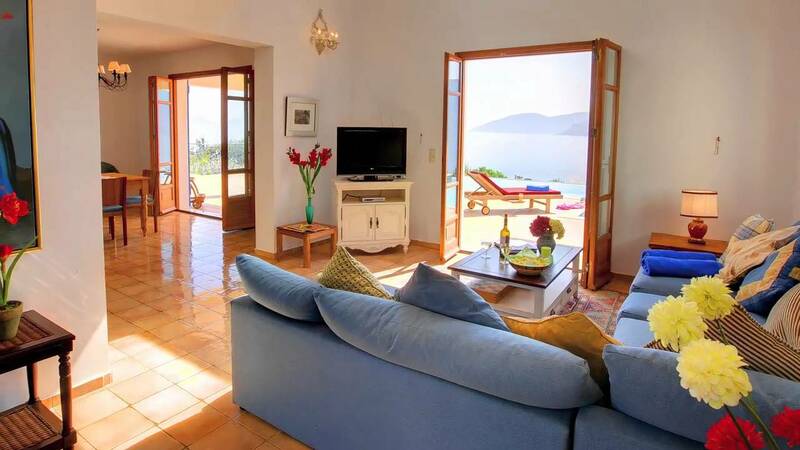 Payments: To book a villa only we require a deposit 40% with the balance due at least 8 weeks prior to arrival. To book a package including flights we will require the villa deposit of £40% plus any payment we make on your behalf for the flying costs. By sending us the deposit you agree to our terms and conditions. Unlike other operators we do not take a security/damage deposit unless the owner specifically requires it. However, should there be any accidental damage please advise our staff in resort prior to your departure. We do have the right to charge for any damage incurred and this will be applied prior to your departure from the villa.